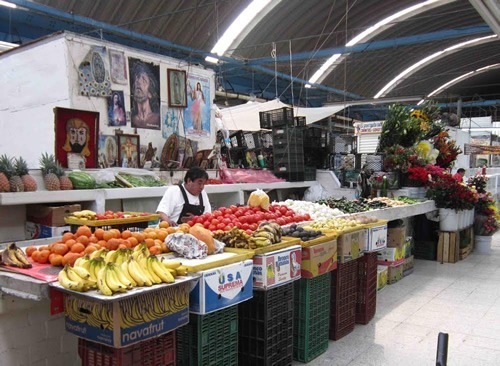 A food vendor at a fruit and vegetable stall in a market in Mexico. The lives of countless Mexicans revolve around the local market: Restaurant owners make regular trips to buy fresh ingredients, mothers and children go before the school semester for new clothes and shoes, taxi drivers get a quick haircut on a break, and office workers stop in for a fast, cheap lunch. Families share the responsibilities of each enterprise—the man chops the meat and the woman takes the money—and the children grow up in this environment of fast commerce, hustle and bustle, bright colors, and constant noise. 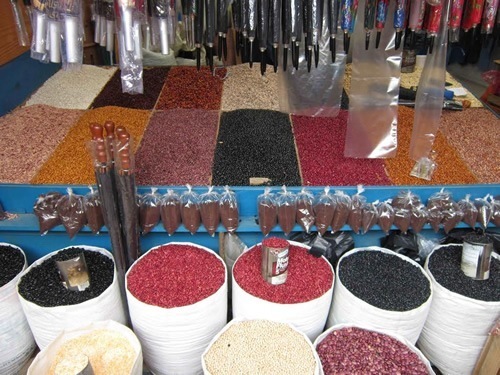 For the foreign visitor, the market is a great place to see local culture firsthand. You can enjoy a good meal, buy plenty of exotic fresh fruit, find toiletries like soap and toothpaste, load up on batteries and new headphones, pick out a big bouquet of flowers for a new friend, and replace dirty, worn-out travel clothes without breaking your budget. Every town and city in Mexico has a market, sometimes many, and whatever the state or region is famous for—mole in Puebla, chocolate in Oaxaca—the market is the best place to find the freshest, cheapest, and most authentic version. Most Mexican markets have long hallways of floor-to-ceiling shoes and clothing for great prices. Look for packs of socks, underwear, and t-shirts—necessities for any long-term traveler. Bags and backpacks are usually just around the corner. You’ll see leather ladies’ purses, school bags featuring Sponge Bob or Spiderman, laptop-sized briefcases, and even big duffle bags for travel. A wide selection makes the market the ideal place to buy clothes. It may not be exotic like tropical fruit or traditional medicine, but hey, it’s cheap. A clothing market on the street. High quality fresh fruit and vegetables are abundant throughout Mexico, and the local market is the best place to observe its variety. Unlike big supermarkets, where produce must travel down a long supply chain, fruit often comes directly from the farm to the market. Therefore, in the market you’ll find whatever’s fresh and whatever’s local. However, fruit and vegetables are only the beginning if you have a taste for natural food products. High quality coffee is grown in many states in Mexico, especially Chiapas and Veracruz. In the sprawling municipal market in San Cristobal de las Casas, Chiapas, a kilo of dark black coffee costs about 60 pesos (US$4), which is half of what you’d pay in fancy coffee shops a few streets away. Coffee and other beans sold in one market stall. Cacao, the rawest chocolate, is native to southern Mexico. You can find raw cacao and good chocolate in every market from Oaxaca in the east to the Yucatan in the west. Cacao seeds are bitter—they need sugar to become chocolate—but every chocolate lover deserves to try the rawest form of their obsession. Chocolate from the state of Oaxaca is the most famous in Mexico, and it’s sold as solid bars or in big bags of powder. Traditionally, chocolate is consumed as a drink, so boil up water or milk and add the chocolate. It may need sugar or may not, so be sure to ask when you buy it. 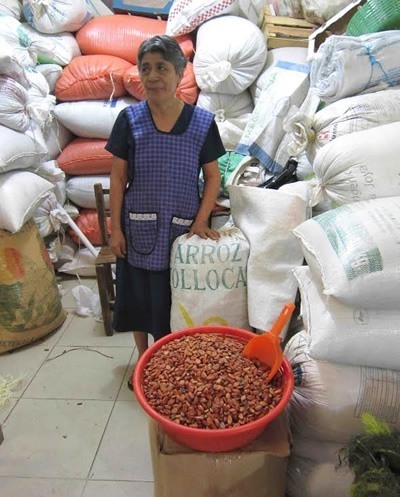 Cacao beans sold by a vendor. Speaking of sweets, most markets have a section of handmade candies. Most are fruit-based and regional. In the city of Puebla, a few hours east of Mexico City, look for stacks of camotes, candied sweet potatoes, piled up in little white boxes in Puebla’s many downtown markets. They come in several flavors, such as vanilla, strawberry, or orange. Come to the market hungry, but don’t make a meal of all the fruit and candy you buy. Most markets in Mexico have a section of small restaurants, usually the best place in town to find the most representative local food. They certainly are the cheapest. For less than 40 pesos (US$3) you can get a set meal, which includes soup or rice, tortillas, beans, and a fresh drink. In Puebla and Oaxaca, look for mole, a curry-like sauce that may include hot peppers, chocolate, cinnamon, pine nuts, or animal crackers. Served over chicken and rice, it comes in black, brown, rust-red, green, or even pink. 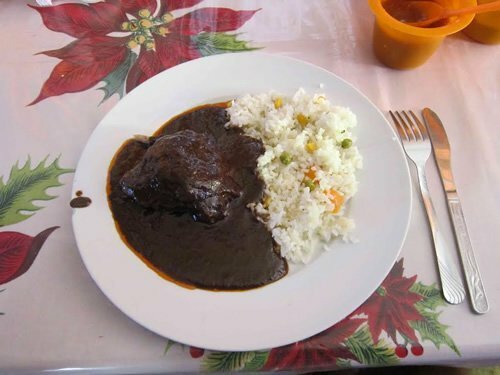 A mole dish served for lunch at a market. In the Yucatan peninsula, look for cochinita pibil (marinated shredded pork), which is served in tacos or other local specialties like panuchos (a black bean-covered tostada). The tangy red sauce is called ashiote, and you can buy a packet in the market to cook at home. Just add lime, and fry it up with chicken or beef. Vendor selling mostly very spicy condiments at the market. And everywhere in Mexico you can find tamales: steamed corn meal wrapped in a cornhusk or banana leaf. There are two kinds of tamales: salados (salty), with meat such as chicken, shrimp or iguana; or dulce (sweet), with fruit or chocolate. Each part of Mexico has different options for tamales, and at the market you’ll find all the local choices in one place. You might just have to order three or four. Sure, you can order delicious fresh-squeezed orange juice, but there’s a lot more to try from market juice bars, and it doesn’t get any fresher. Stain your teeth red with a vampiro (vampire juice), which is made with beet, carrot, celery, and orange juice. 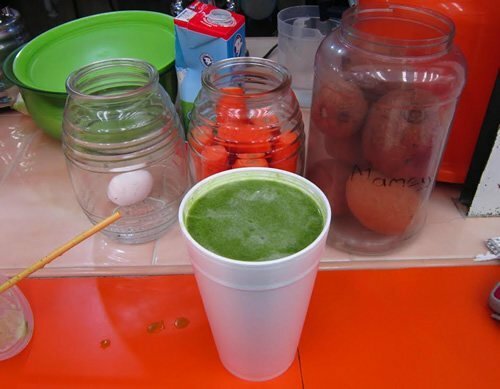 Jugo verde (green juice) may have nopales (cactus leaves), celery, parsley, pineapple, the native Mexican fruit xoconostle, and orange or grapefruit juice. Finally, try hearty alfalfa juice, which may also include lime, pineapple, guava, and more. Alfalfa juice at the market. Juices can be regional too—for example, look for chaya juice in the massive market in downtown Merida, the capital of Yucatan state. Chaya is a leaf, like alfalfa, but it has a special flavor and can only be found in the Yucatan. Juice bars are everywhere in Mexico, but are always cheap in a market. In most places a big Styrofoam liter costs 20 pesos (US$1.20). Of course, markets have much more than food and clothing. You can find inexpensive, easy-to-carry items that not only make good souvenirs, but also can teach you a little about Mexican culture. 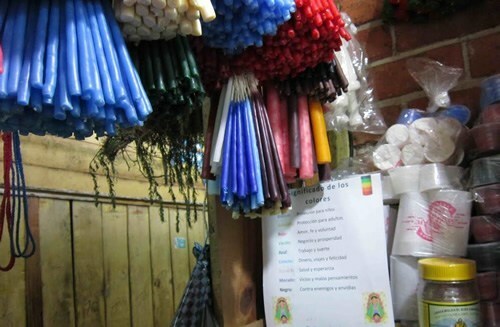 Colorful candles are sold in bundles in the section of religious items in most markets. The candles are lit before effigies of saints, and each color is used for a different petition—red is for love, blue is for work, and so on. But there’s no reason you can’t use them at home, and like everything else in the market, the price is right at less than 10 pesos (US$0.60) for a handful-sized bundle. Colorful religious candles at the market. 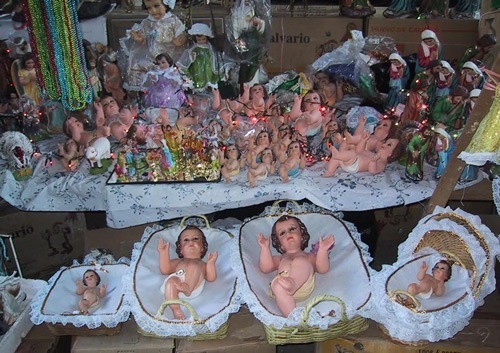 Figures of the baby Jesus at the market. For a cheap, natural deodorant, look for Alum stone (piedra de alumbre). This whitish, crumbly substance is used in religious ceremonies, but get it wet and rub it under your arms or on your face after shaving. 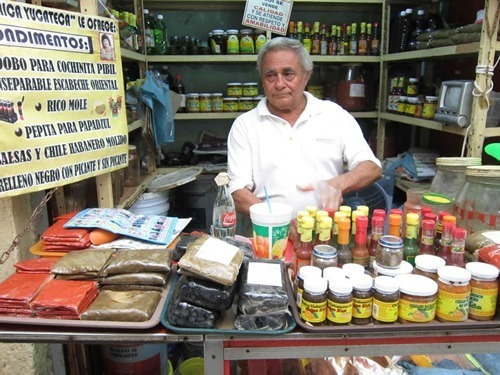 Alum sells in alternative medicine stores in the U.S. for a lot more than 10 pesos (US$0.60) a kilo in a Mexican market. Finally, amber-colored copal is a good incense alternative. This hard tree resin is burnt in religious ceremonies all over Mexico and Central America. You will recognize its sweet, earthy smell if you have visited indigenous churches or seen dance ceremonies on the street. Take some home for an olfactory reminder of your trip to Mexico. Artisanal souvenirs are generally well-made and tasteful in Mexico. You’ll see them in little airport tourist shops as soon as you get off the plane: colorful woven purses, sun-and-moon pottery, hand painted bowls and glasses, minutely detailed leather belts, and endless key chains, pens and magnets. As you travel, you’ll notice that certain goods are the same all over Mexico. As you can imagine, the farther you get from the airport, the better prices you will find. In places frequented by tourists, like Cancun or Mexico City, there are whole markets of handicrafts and souvenirs. 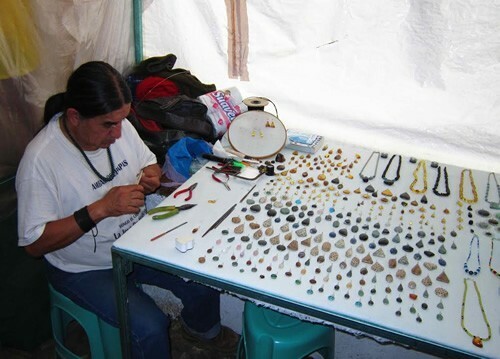 Making and selling souvenirs in Mexico, including amber stones. Yes, you can haggle in Mexico, but you will seldom need to engage in the kind of hard bargaining you might do elsewhere in the world, like touristy parts of Asia or even neighboring Guatemala. However, some merchants will try to overcharge tourists, especially if you don’t speak Spanish. Ask around at a few stands to learn the fair price. Rarely will something be available at only one stand. To find out if you are being overcharged, politely thank the merchant and walk away. If she immediately calls out a lower price, let the bargaining begin — or look for the same product elsewhere now that you have a better idea of the price. Also, there’s a big difference between buying t-shirts and shot glasses in the tourist market in Cancun and buying a bag of fruit from the municipal market in a small town like Valladolid two hours away. But it doesn’t make much sense to haggle for 5 or even 10 pesos when buying fruit in a non-touristy, “real” market. Typically the first price they give you is the real price, and if you’re not sure, hang out a little bit until you overhear a local asking the same question. Perhaps they will overcharge you a little, perhaps not, but why drive a hard bargain over less than a dollar with people who sell fruit for a living? It not only makes you look bad, but can reflect on tourists in general. In many markets in Mexico, you will constantly be called out to as you walk around. ¿Que le damos? ¿Qué buscas? (What can we give you? What are you looking for?) Even if you don’t speak Spanish, you will quickly learn these phrases as you travel though Mexican markets. You only need one word—gracias (thank you). Just smile and give a firm gracias, which also means no thank you. Don’t hesitate to look at something, accept a free sample, ask questions or ask for the price. But, if you don’t want to buy it, don’t be apologetic, and don’t feel pressured —though the pressure will be on. Just say gracias, smile, and walk away. Bring small bills, preferably 100 pesos or less. They might not have change for a big bill like 500 pesos, and using one to buy something cheap will reinforce the view that you are a rich foreigner. Also, 500 pesos may be equivalent to what some vendors earn in a week, or longer. If you want to take photographs, always ask first. Many people don’t like having their picture taken, especially in southern Mexico with its large Mayan population. It is actually true that some Mayans believe that they lose part of their soul when they have their picture taken. Buying something first is the easiest way to get permission to take a picture. Finally, take it slow. Look around, stop for a meal or a drink, and ask questions. If someone is especially nice, spend a few pesos. 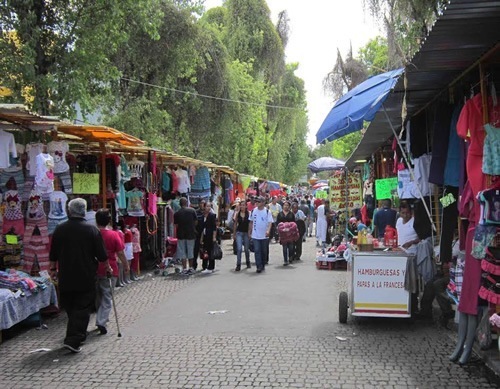 Shopping at a market isn’t a race, and buying—even haggling—doesn’t need to be a competition. Rather, it’s a great chance to broaden your palate, absorb some culture, and leave a good impression on the friendly, hardworking people you meet.